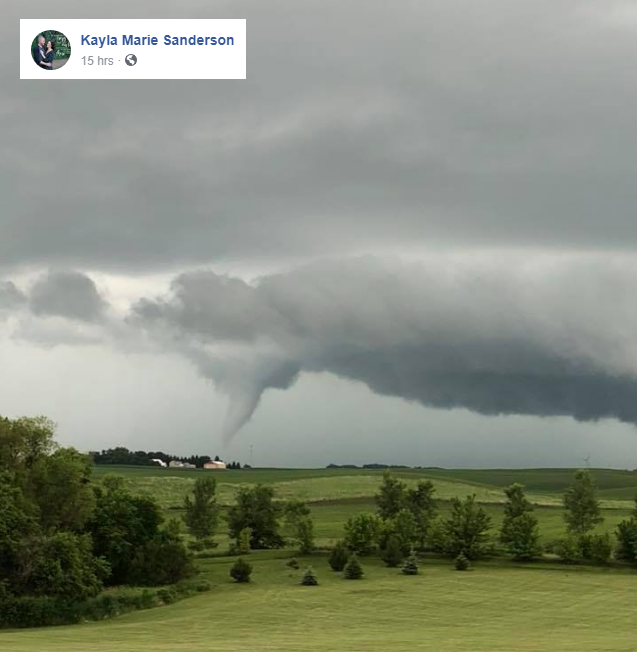 Thanks to Kayla Marie Sanderson for the picture below, who shared this on Facebook of a tornado that developed near Arco, MN on Sunday! The good news is that the storm didn't produce any damage. 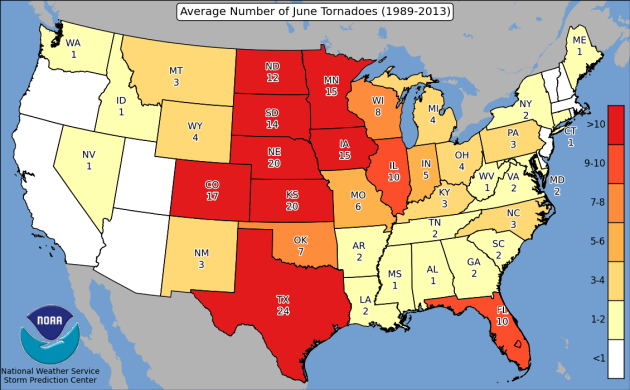 Interestingly, this becomes only the 2nd tornado in the state of Minnesota so far this year. The other weak tornado touched down in near Minnesota Lake, MN (Faribault County) on Friday, May 25th. 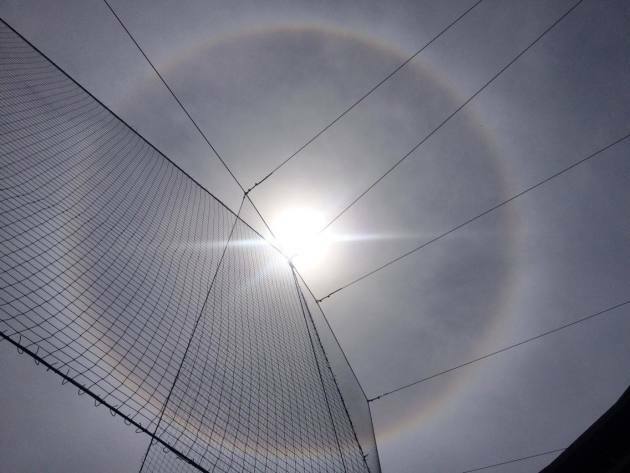 I was at the Twins game this weekend and happened to catch this halo, which looks like a ring around the sun. This reflection of light through ice crystals in upper level clouds made for a bright spectacle during the game. The old adage states that a ring around the moon or sun, then rain or snow will surely come. 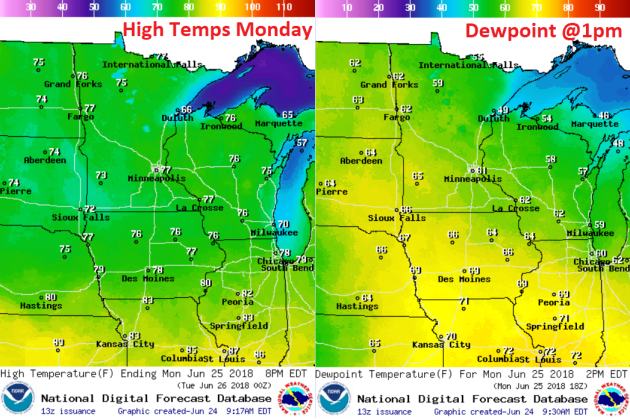 A slow moving area of low pressure will keep skies a bit unsettled through the early week time frame with bouts of showers and storms across the Upper Midwest. It looks like ongoing showers and storms from Sunday will linger on Monday and Tuesday before shifting east into the Great Lakes Region on Wednesday. Here's the rainfall potential through 7pm Wednesday, which suggests areas of heavy rain falling across far southern MN. Some spots could see up to 1", especially closer to the Iowa border. 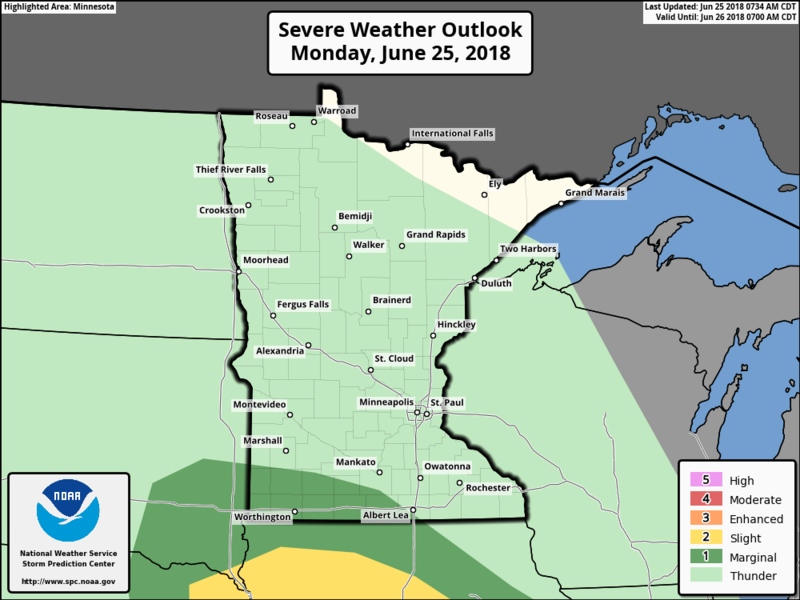 NOAA's SPC has issued a MARGINAL risk of severe weather across far southern Minnesota on Monday for the potential of strong of a few strong to severe storms. The primary concern would isolated large hail and/or damaging wind potential. Stay tuned. According to NOAA's WPC there is a slight risk of excessive rainfall across parts of the Midwest, including Minnesota. With all the rain that some spots have seen over the last several days, there is certainly a chance that flooding will be possible. This was a sunset picture from Saturday around 9pm. 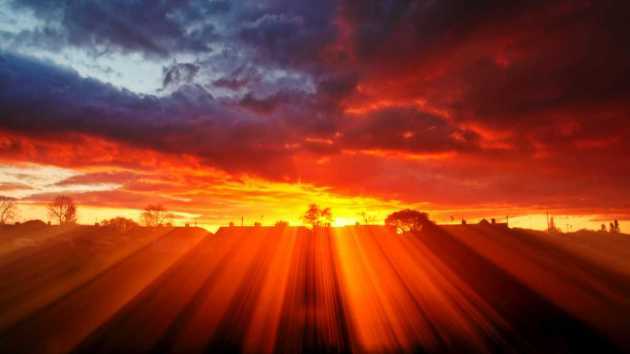 Daylight hours are still very long here in the northern hemisphere, but now that we are past the summer solstice, daylight hours are dwindling. Keep in mind that daylight hours won't dwindling too fast here through the end of June, but we wiill lose a few minutes by the end of the month. 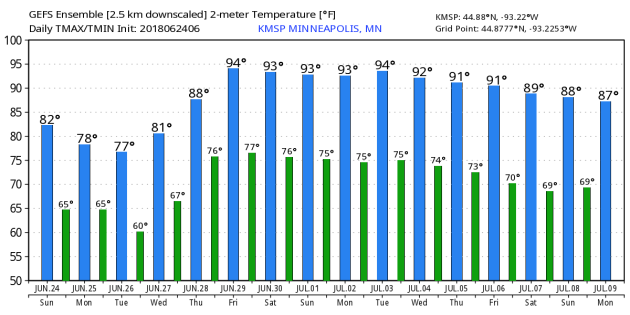 The extended forecast into the early part of July shows hot weather returning with highs warming into the 90s. 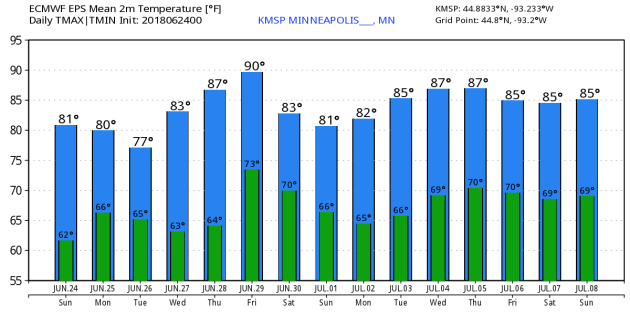 Now the GEFS model (top picture) seems to be a little warmer than the ECMWF (bottom picture), but they both show temperatures warming by the end of the month/early July. According to the Twin Cities NWS, the period from May 1st through June 22nd was the warmest such period on record! The average temperature was 69.3F, which tied the record also set in 1934. Quite a difference from April when the average temperature was nearly -10F below average and the 4th coldest April on record. Here a satellite image of Tropical Storm Daniel in the Eastern Pacific from early Monday. 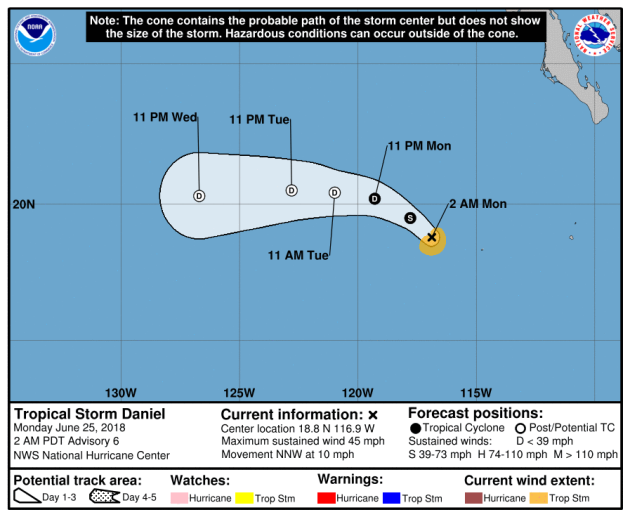 Daniel became the 4th named storm of the season in the Eastern Pacific over the weekend, but will likely fade over the next few days as it drifts west away from any major land mass. 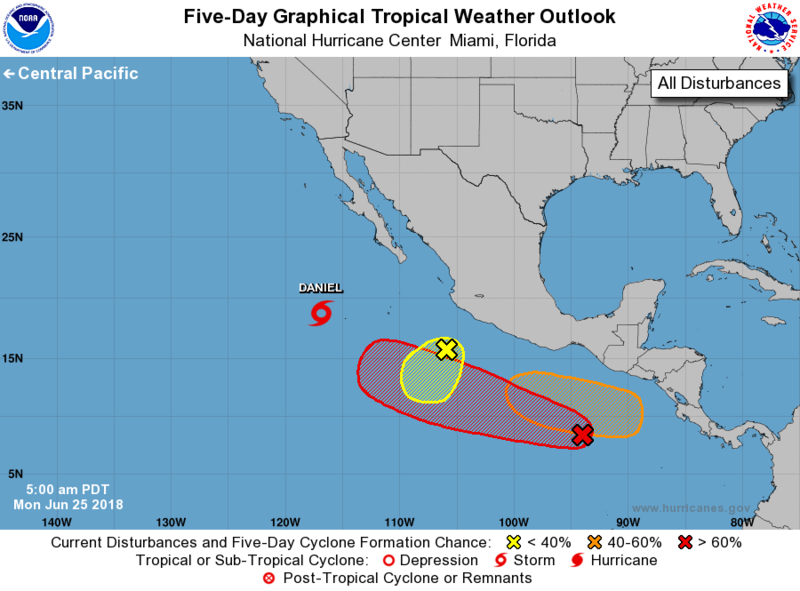 As of early Monday morning NOAA's NHC official forecast for Tropical Storm Daniel had it dropping to Tropical Depression strength late Monday and drifting west away from any major land mass. So long "Fish Storm". 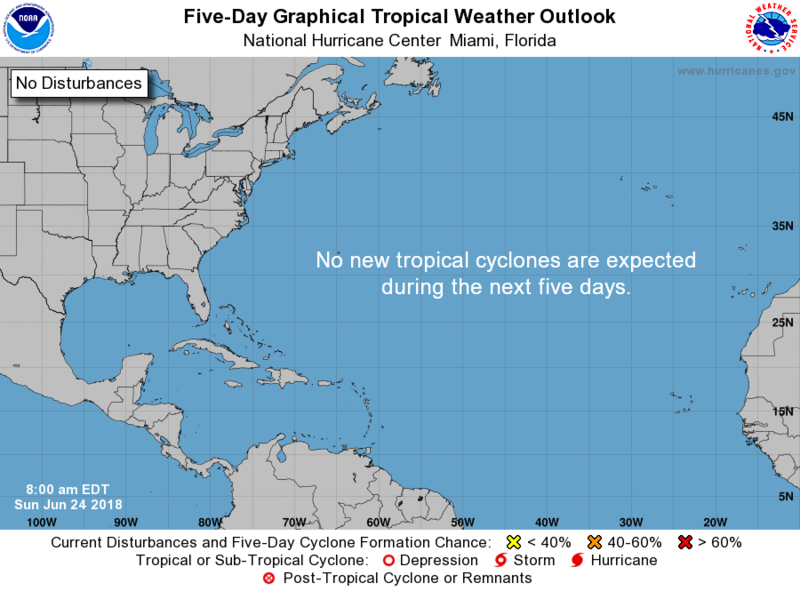 According to NOAA's NHC, the Atlantic Basin looks pretty quiet. At this point, there are no new tropical cycolnes expected during the next 5 days. This is neat map from NOAA's NHC, which shows where we typically see tropical cyclones develop in late June. Note that in the Atlantic, the points of origin correlate well with where the named storms have been developing in the Eastern Pacific. Also note that points of origin start showing up in the Central Atlantic in late June, but really heat up in August and September. "National Lightning Safety Awareness week was started in 2001 to call attention to this underrated killer. Since then, U.S. lightning fatalities have dropped from about 50 per year to about 30. This reduction in fatalities is largely due to greater awareness of the lightning danger, and people seeking safety when thunderstorms threaten. During National Lightning Safety Awareness Week, we encourage you to learn more about lightning and lightning safety. " "1 person dies after lightning strike on beach near Sarasota"
"One person died after they were struck by lightning Sunday afternoon while on a beach near Sarasota, authorities said. The Sarasota County Sheriff's Office said the victim was struck just after 2 p.m. in the 6000 block of Midnight Pass Road in Siesta Key. The victim, who was not identified, was treated at the scene by paramedics and lifeguards. Paramedics transported the victim to a local hospital, where the victim died. Florida routinely leads the nation in lightning deaths, according to the National Weather Service. Five of the 16 fatal lightning strikes in the U.S. in 2017 happened in Florida, which was down from 2016, when there were 10 fatalities in the state. This year in South Florida, one man was killed earlier this month in Margate while doing yard work and a farm worker was killed in Parkland in May. Two other workers were hurt during the same storm. 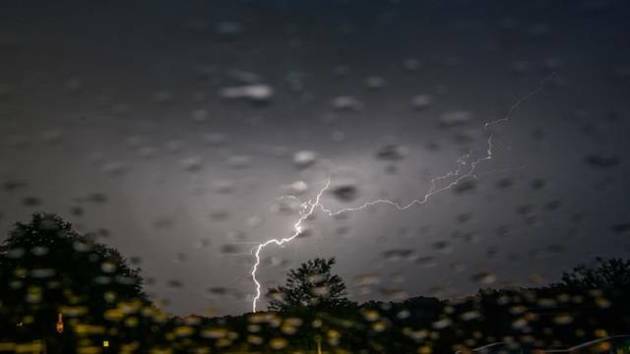 "In terms of lightning, Florida has the most lightning per square mile of any state in the U.S. and also a sizable population," National Weather Service lightning safety specialist John Jensenius said in a news release earlier this year. "In addition, Florida has many outdoor recreational activities that cause people to be vulnerable to a lightning strike. Finally, in Florida, lightning is a very common afternoon threat for those who work outside or are outside as part of their daily routine." Did you know that lightning ranks as one of the top weather related killers in the U.S.? An average of nearly 50 people are killed each year in the United States and so far this year, 6 people have died from lightning; 3 in Florida, 1 in Texas, 1 in Tennesee, and now 1 in Arkansas. Interestingly, from 2008-2017, 222 males have died, while only 63 females have died. 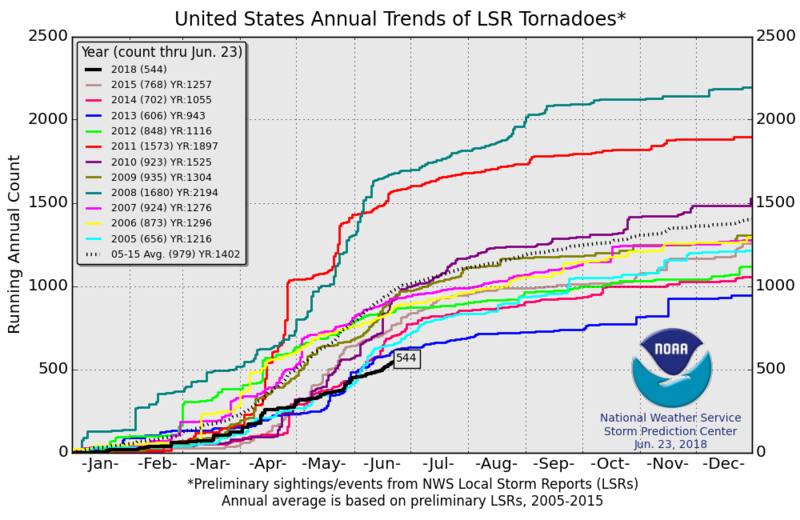 According to NOAA's SPC, there have been ONLY 544 preliminary tornadoes so far this year (through June 23rd), which is quite a bit less than what we had at this time over the last several years. 2018, no question, has been a very quiet year in the national tornado department. Interestingly, there were 1,432 tornadoes at this time in 2011; that year ended with 1,897 tornadoes, which is nearly 500 more than the short-term 2005-2015 average. 1.) 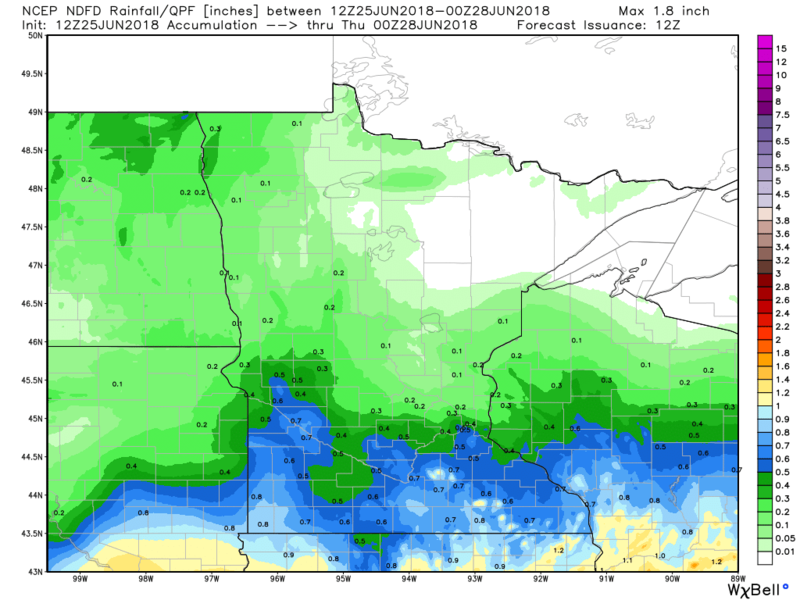 Heavy rain across portions of the middle and upper Mississippi Valley, Mon-Tue, Jun 25-26. 2.) Excessive heat across much of California's Central Valley, Mon-Thu, Jun 25-28. 3.) Excessive heat across the interior central and eastern Gulf region, and the interior Southeast, Mon, Jun 25, and again on Thu-Fri, Jun 28-29. 4.) Excessive heat over the middle and lower Mississippi Valley and adjacent parts of the eastern Plains, and the lower Ohio and lower Tennessee Valleys, Mon-Fri, Jun 25-29. 5.) High winds over the south-central Plains, Mon, Jun 25. 6.) 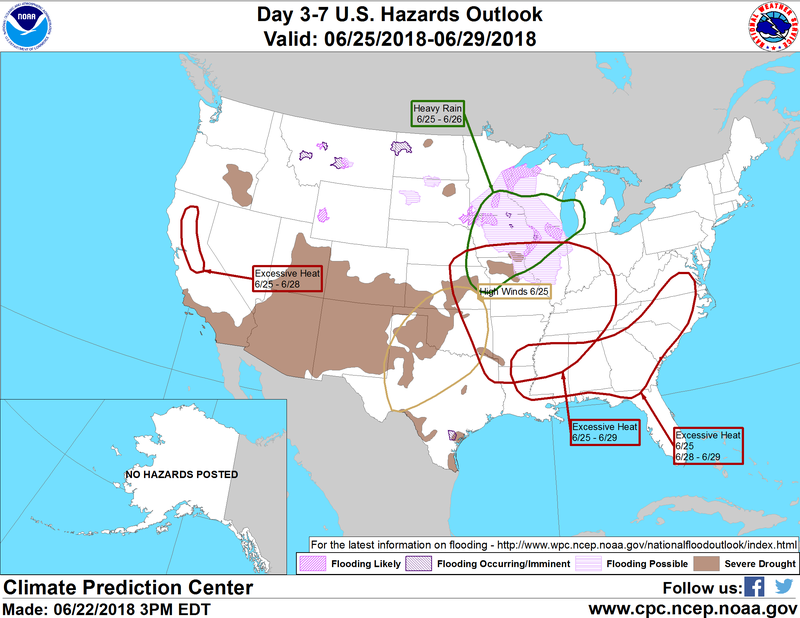 Flooding possible, probable, imminent or occurring over the general vicinity of the Midwest, northern Plains, northern Rockies, and south Texas. 7.) Slight risk of excessive heat across approximately the northeast quarter of the CONUS, Sat-Fri, Jun 30-Jul 5. 8.) Moderate risk of excessive heat from most of the Great Lakes region and northern Ohio Valley to the Atlantic Seaboard from Maine to Virginia(excluding the Appalachians), Sat-Tue, Jun 30-Jul 3. 9.) Slight risk of heavy precipitation over the north-central Mississippi Valley and nearby parts of adjacent states, Sat-Mon, Jun 30-Jul 2. 10.) Severe Drought across parts of the middle and lower Mississippi Valley, portions of the Great Plains, portions of both the Rockies and Intermountain region, and far southern California. 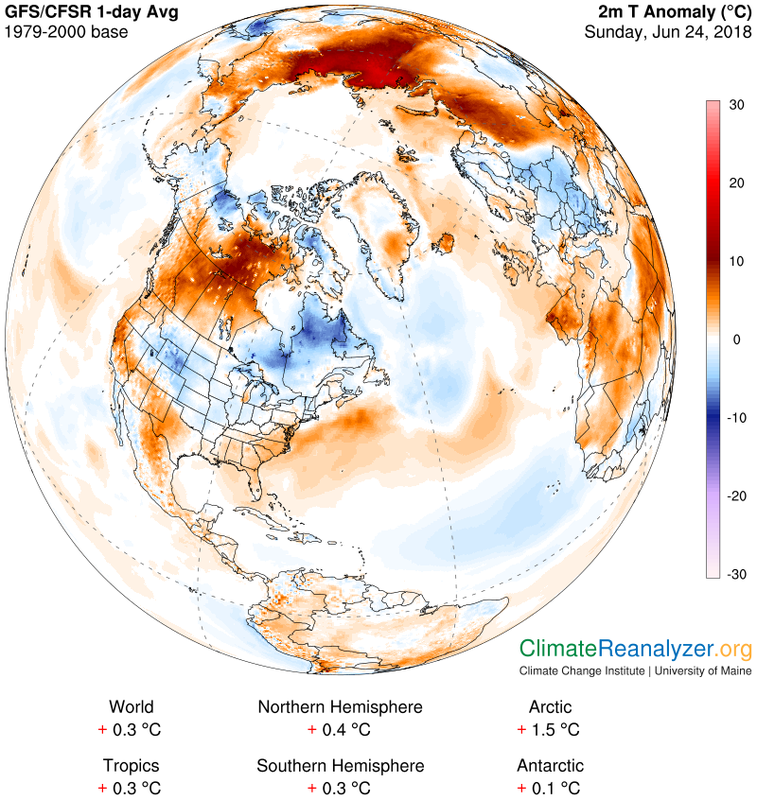 The temperature anomaly across North America on Sunday showed below average temperatures across much of the Central US and into eastern Canada, while warmer than average temps were found across the farsouthern US and the western half of Canada. Here's the temperature anomaly as we head into the last week of June. Note that parts of the country look to start off a little cooler than average, but heat looks to make a return as we head through the week. The weather loop below shows fairly active weather continuing across the Central US with strong to severe thunderstorms across the Upper Midwest and flooding rains possible as well. According to NOAA's WPC, the 7-day precipitation outlook suggests areas of heavy rain continuing across parts of the Central US. Several inches of rain can't be ruled out along with localized flooding, especially across the Upper Midwest, including parts of Minnesota. Here is the national drought map from Thursday, June 19th, which shows extreme and exceptional drought conditions across much of the Four-Corners region and into the Central and Southern Plains. Heavy rains across the coastal bend of Texas helped with some of the drought there, but unfortunately it led to significant flooding. For my 60th birthday (how did THAT happen?) my kids got me a drone, a DJI Spark. I feel like a 4-year old with a new toy. Selfie? How 'bout a droney? In the meteorological world, drones are doing things no pilot would dare to attempt. NOAA deploys "Coyote" drones into hurricanes, able to fly at low altitudes for over an hour, beaming back real-time data the entire time. No Hurricane Hunter can fly that close to the ocean's surface. Oklahoma State is sending powerful drones into tornadic supercell T-storms, to get a 3-D thumbprint of the environment. They are designed to weather hail and winds up to 120 mph. My new drone can't do that, by the way. Yet. After a damp start skies clear for a time Monday, with a dry east wind. But a stubborn storm will push showers and T-storms back into the area Monday night and Tuesday. We heat up into the 90s on Friday, but a slightly-cooler-front sparks a few weekend T-storms, and some relief from swampy heat Sunday. 90s return just in time for the rockets red glare on July 4. A bird's eye view of fireworks with my new drone? Better call 911 now. MONDAY: Cool sun. Storms tonight. Winds: E 10-15. High: 78. MONDAY NIGHT: Chance of T-storms. Winds: ESE 10-15. Low: 64. TUESDAY: Showers likely. A few claps of thunder. Winds: E 7-12. High: 76. WEDNESDAY: Partly sunny. Warmer and drier. Winds: NW 7-12. Wake-up: 63. High: 83. THURSDAY:Plenty of sunshine, fine summer day. Winds: SE 8-13. Wake-up: 66. High: 87. FRIDAY: Sizzling sunshine. Few T-storms north. Winds: SW 10-20. Wake-up: 71. High: 95. SATURDAY: Still tropical. Chance of a T-storm. Winds: W 7-12. Wake-up: 74. High: 91. SUNDAY: Cooling off. Few T-storms possible. Winds: SSW 5-15. High: 89. 2003: Heavy rain falls across central Minnesota. Elk River picks up 8.19 inches. 4.36 inches fall in 4 hours in Maplewood, and there are reports of street flooding in St. Paul. Strong winds topple trees in Richfield. 1950: Flooding hits Warroad. Strong winds accompany waters that rose 4 feet in 10 minutes. According to NOAA's CPC, July 1st - 7th will be warmer than average across much of the nation with the exception of parts of the Northwest. "Deadly Monsoon Rains Have Displaced a Million People—and They’re Not Letting Up"
"The monsoon season can be a matter of life and death for people in South Asia. On the one hand, its rains nourish crops that feed millions. On the other, floods and landslides can create deadly hazards, as evidenced by what’s going on in northeast India and Bangladesh right now. Over the weekend, heavy rains flooded the Brahmaputra river, which flows through the Himalayas to make its way into India and Bangladesh. More than a million people are without homes as of Tuesday, Reuters reports. Nearly 20 people have died in the Indian states of Assam, Tripura, and Manipur. In Bangladesh, more than 10 people are dead. Entire villages are facing displacement, and the rain’s not stopping. Helicopters are on standby, according to the water resource minister for Assam." "What happened last time it was as warm as it’s going to get later this century?" "Kids today will be grandparents when most climate projections end—does the past have more hints? The year 2100 stands like a line of checkered flags at the climate change finish line, as if all our goals expire then. But like the warning etched on a car mirror: it’s closer than it appears. Kids born today will be grandparents when most climate projections end. And yet, the climate won’t stop changing in 2100. Even if we succeed in limiting warming this century to 2ºC, we’ll have CO2 at around 500 parts per million. That’s a level not seen on this planet since the Middle Miocene, 16 million years ago, when our ancestors were apes. 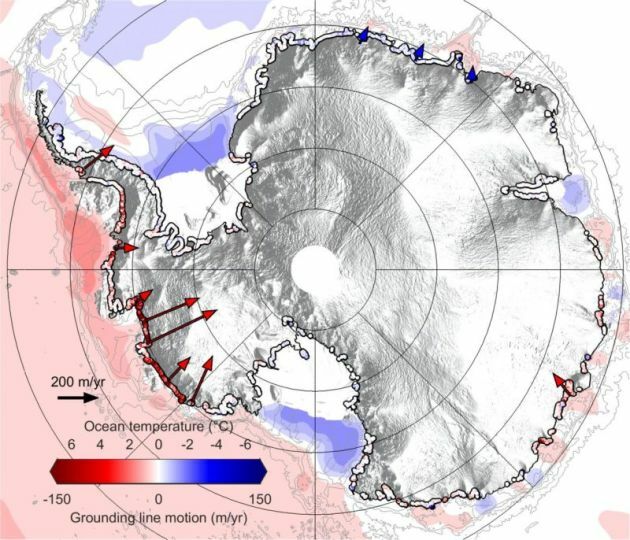 Temperatures then were about 5 to 8ºC warmer not 2º, and sea levels were some 40 meters (130 feet) or more higher, not the 1.5 feet (half a meter) anticipated at the end of this century by the 2013 IPCC report. Why is there a yawning gap between end-century projections and what happened in Earth’s past? 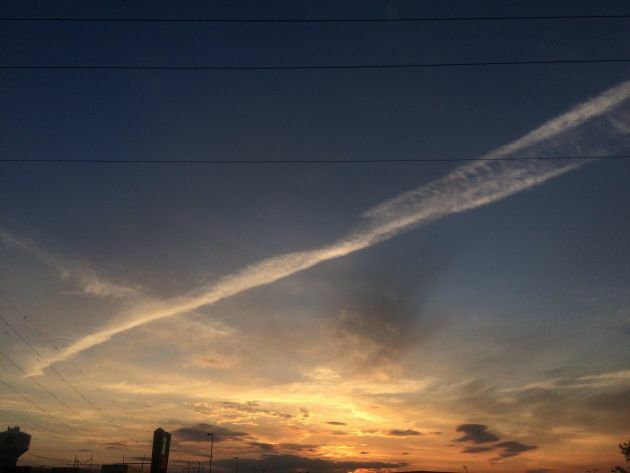 Are past climates telling us we’re missing something?" "How nature can help you predict the weather"
"Delete your weather app – the best forecasters are birds, plants and animals. Here are five ways that nature can help you predict the weather. Open daisies If rain is on the way, daisy petals close up to avoid letting a single drop in, and some even droop downwards. When the weather is fine, however, they remain open. This entire response mechanism only functions during the day, because daisies close up shop in the evenings, like many other flowers. This opening and shutting mechanism is due to a difference in growth between the upper and lower surfaces of a petal. The upper surface grows faster at higher temperatures than the lower surface, so the flower opens up. Dark rain clouds cause low temperatures, encouraging the underside to grow faster, and making the petals close up. This process also explains why they close at night, when it’s cooler." "This Is What the World’s Largest Sand Desert Looks Like After a Tropical Cyclone"
"One of the driest places on earth is looking a bit wet these days. Tropical Cyclone Mekunu rolled over the country of Oman back in May, bringing huge downpours of rain — about 11 inches — to the capital city of Salalah. The nearby desert of Rub’ al-Khali, the world’s largest sand desert, also received significant precipitation. So much so that NASA’s Operational Land Imager captured images of hundreds of tiny lakes that formed in the ripples of the sand dunes, in an area known as the Empty Quarter. The satellite took the images three days after the storm." "Whether wheat weathers heat waves"
"A heat wave sweeps through a city and people swelter, running indoors to find air conditioning. But crops out in a field aren't so lucky. For them, there is no escape. 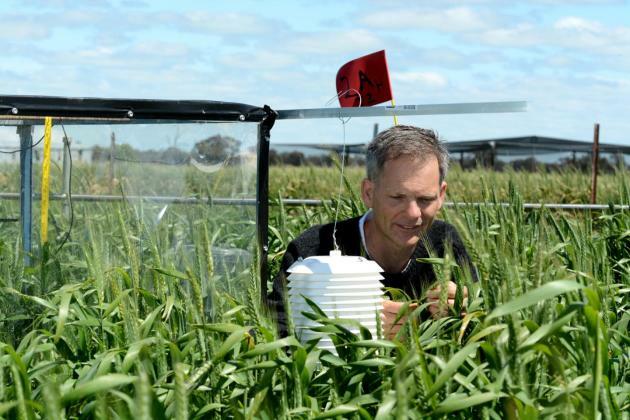 Scientists in Australia are working to understand how heat waves impact wheat. They are mixing observational studies with techniques from computer science. This will allow them to create models to understand how wheat will respond in certain conditions. Heat can affect plants and the soil, water, air, and microbes around them in many different ways. Knowing how all of these factors affect crops could help farmers protect their plants against heat waves' effects. 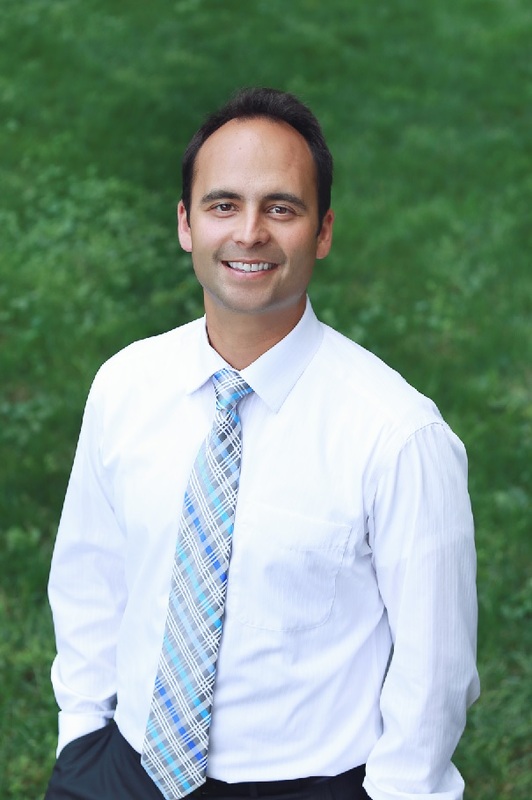 "Heat waves can greatly reduce wheat in growing regions and modeling could aid in finding strategies to limit the impact of extreme weather and climate change," says James Nuttall. Nuttall works for Australia's Agriculture Victoria, Department of Economic Development, Jobs, Transport and Resources. "This can specifically come in handy during the sensitive periods of crop flowering and the grain filling phase." Wheat is an important crop with a worldwide production of 729 million tons in 2014. It is a major source of human nutrition. Nuttall says that maintaining stable production into the future includes finding ways to reduce the effects of heat stress to plants."